Stackable Mama Pads are a unique 3-in-1 system that will allow you to adjust absorbancy throughout your menstrual cycle without having to buy several sizes of pads. One Stackable pad can be a pantiliner, regular pad, and heavy pad. Each complete pad set includes an outer shell and two liners. One liner is smaller for light days, one is larger for regular days, and using both together is great for heavy days. Both pads snap securely onto the shell so you'll never need to buy a different size of shell...every Knickernappies Stackable pad fits onto every shell! With the Stackable system, you will likely only need a few shells since the shell only needs to be changed if it gets soiled. Otherwise, just unsnap the soiled pad and snap on a fresh one! The outer shell is very thin, but waterproof fleece. It won't slide around the way PUL pads can! 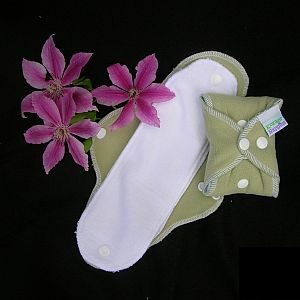 Large pads are made from microfiber, hemp, and cotton/poly velour. Small pads are microfiber and velour. The velour against the skin is so soft and comfortable. Pads are very absorbant and comfortable to wear. *Available as a Complete Pad Set (2 pads, one shell) or as Extra Pad Set (2 pads, no shell). By popular demand we have added our Mini Wet/Dry bag perfect for Mama pads. The easiest way to travel and be discreet while using washable menstrual pads. 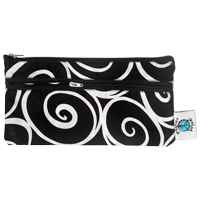 A zippered "dry" section to keep your clean ready to use pads in plus a zippered "wet" section to keep your soiled pads in while out and about. The "wet" section has the same great no-leak design so you can trust that all that you need to stay inside the bag will! Our mini wet/dry bag is small enough to keep in your purse or diaper bag yet discreet enough to be carried alone to the bathroom without anyone knowing. This is your perfect solution! Don't use Mama pads? The Mini Wet/Dry bag works great for just about anything you need on the go. It is so petite it fits just about anywhere! Dimensions 5"x10". 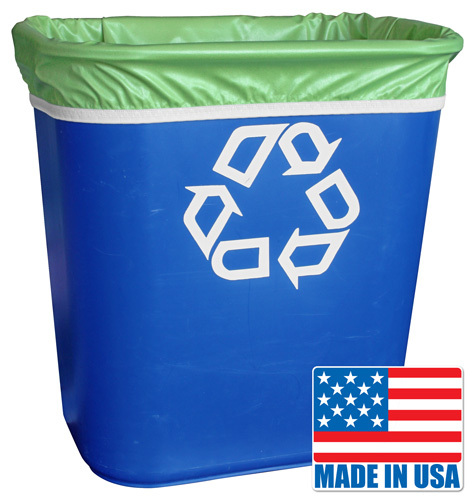 The Planet Wise Reusable Trash Bags are washable, waterproof, and reusable - this means less waste around the entire house! 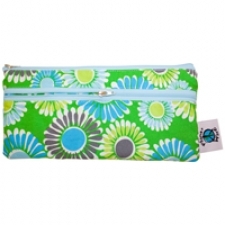 Perfect for a smaller diaper stash, home office, mama cloths, and many more. Perfect 5 Gallon Size!